Wherever Dean Joseph Quillian went – including business meetings – he was always drawing on anything that was handy. He roamed the halls of the Perkins School of Theology from 1960 to 1981 as dean before retiring to Washington. He started to draw in his childhood on little pieces of paper. The first thing he learned to draw was called a “love knot,” which can be seen in many of his drawings since. Quillian’s second-grade teacher’s father taught him the technique. As an adult, he drew these designs as a way to keep his hands busy and let off nervous energy. In meetings, people often looked saw him drawing and thought he wasn’t paying attention. In reality, the drawing helped him to focus. 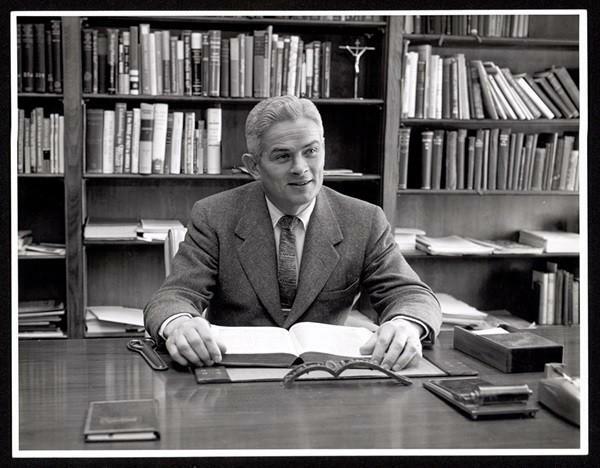 Joseph D. Quillian Jr. pictured in 1960. 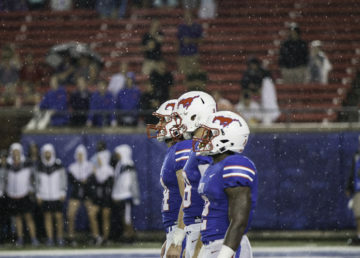 Photo by Messina Studios. Courtesy of Bridwell Library. The Bridwell Library opened an exhibition Friday featuring Quillian’s works. “The designs in the exhibit have been stored in the archives at Bridwell Library since Dean Quillian retired in 1981. In recent years public interest in mandalas has grown, so the time seems right to share Dean Quillian’s works. Some are hand-drawn. Others are printed. All are intriguing and, in my opinion, beautiful,” said Timothy Binkley, curator of the exhibit and archivist at Bridwell Library. The exhibition begins with Quillian’s works in the 1940s, when he was a chaplain in the U.S. Navy, then when he came to Perkins. As seen on the back of a chapel bulletin, Quillian’s mandalas aren’t yet round, but square. 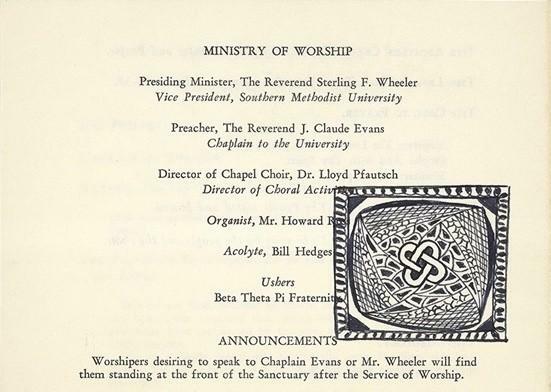 Quillian's square-shaped drawing on the back of a 1960 worship service bulletin. He later started rounding off around the square and discovered around 1970 that what he was drawing were actually called mandalas – an ancient Hindu art form still practiced today. It’s a meditative drawing form that exemplifies bringing order to chaos. “Mandala” is a Sanskrit word meaning “circle,” and Quillian just stumbled into the practice. To him, he was just doodling and drawing, but his doodles turned into mandalas. Quillian’s mandalas were subconscious reflections of what his hands were doing while his mind was thinking about other things. His mandalas are both unique and intricate. Quillian often continued coloring when he went home using black and blue pen; later, he began coloring them in, Binkley said. His mandalas are all freehand drawn without using rulers or compasses. Therefore, they’re not always completely symmetrical, but they’re close. The four mandalas used by Stanley Marcus. Once he started coloring the mandalas, people really took notice. Stanley Marcus saw some of Quillian’s drawings and liked them enough to turn the mandalas into scarves sold for $1000 apiece. “I thought they were just too beautiful to stay in the boxes. They need to come out where people can see them and appreciate his artwork,” Binkley said. 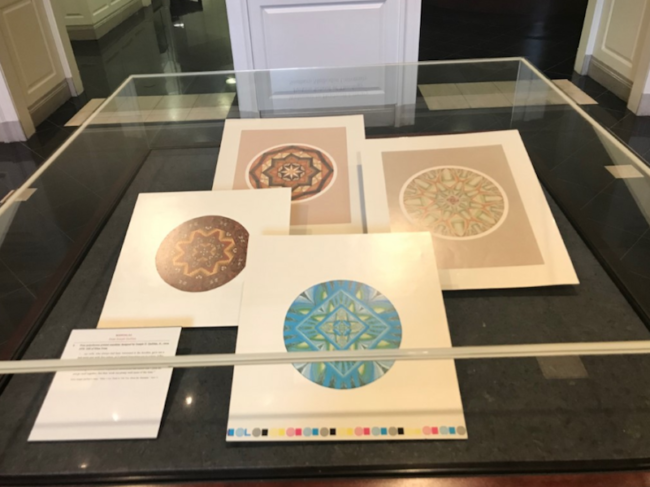 These mandalas and other documents that form the life of Joseph D. Quillian Jr. will be on display at Bridwell Library until Aug. 19.